most of the weekends the choice of menu end with this biryani only.. Sure you’ll also love the flavors and spices in this recipe..
* Grab all the ingredients..
* Soak the rice for 10 mins.. Drain them and fry in ghee and keep aside..
* Saute the Onions till they are pink in color. * Fry the Ginger Garlic paste..
* Add the Grinded paste cook till they separates the ghee. * Add the Chopped Tomatoes. * Add the Chicken pieces, masalas[ Chillie powder, Corriander powder, turmeric powder, and graham masala] with some salt..
* Add some water and cook till the chicken was done..
* When the water goes up, add the curd. * Again cook till they semi dry..
* Add the Prepared rice..
* Add 1 cup coconut milk and 1 1/2 cup water to this and bring it to boil… add all the chopped mint leaves and coriander leaves..
* Once they start to boil close the pressure cooker lid with..
* Cook on High flame for 2 whistles..
* Make it cool and After opening the Cooker poke the rice with forks.. I am a great biryani fan, delicious biryani dear…. Biriyani is the versatile dish for everyone. yours looks so nice. I cant take away my eyes out of these cute pictures dear!! They are Awesome!! 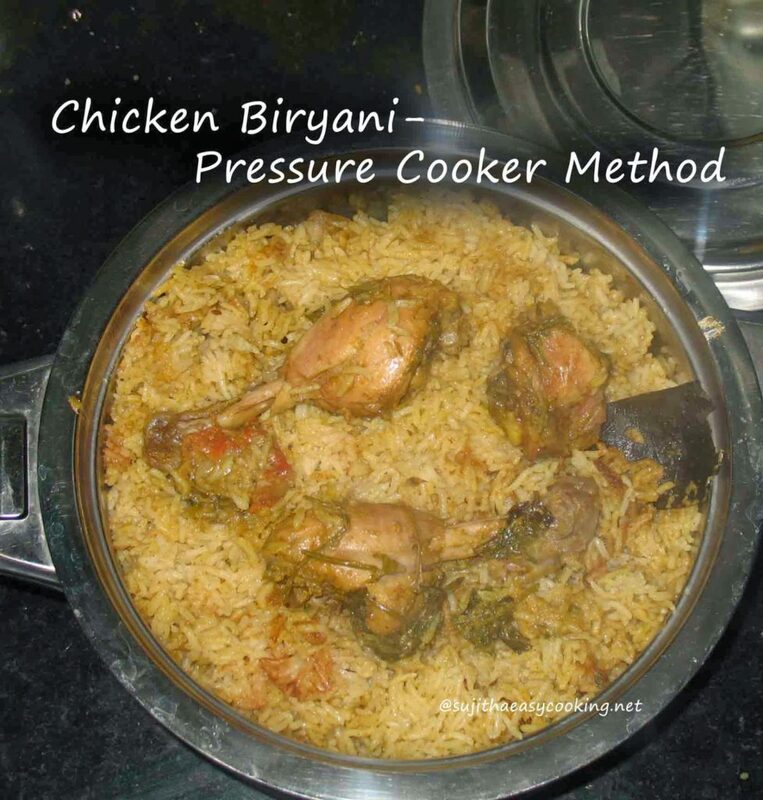 its pulav dear…never tried pressure cooker method..vl do next time..